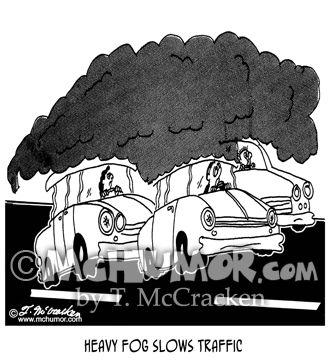 Traffic Cartoon 5117: "Heavy Fog Slows Traffic." People and cars are literally flattened by heavy fog. 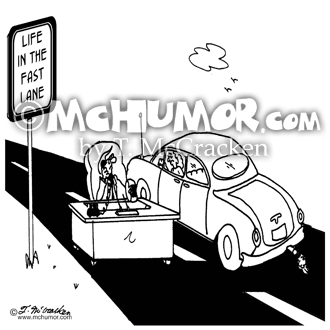 Traffic Cartoon 5116: "Life in the Fast Lane." A man's desk is in the middle of a highway. 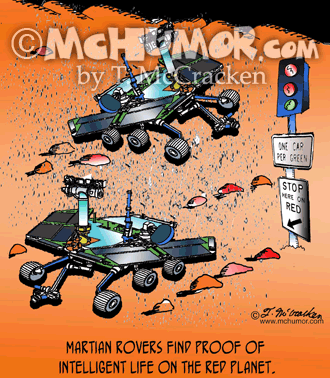 Traffic Cartoon 4851: "Heavy Traffic." 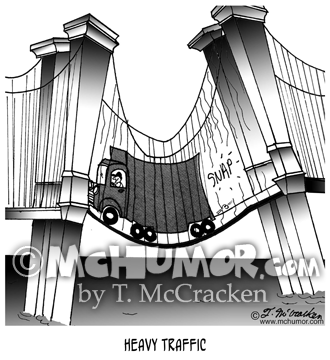 A bridge buckles under the weight of traffic. 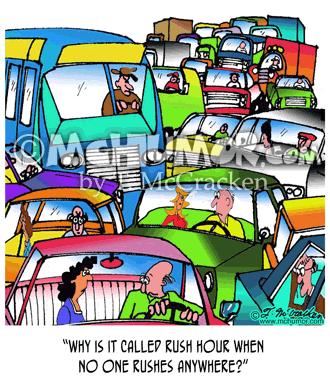 Traffic Cartoon 5114: In a traffic jam someone asking, "Why is it called rush hour when no one rushes anywhere?" 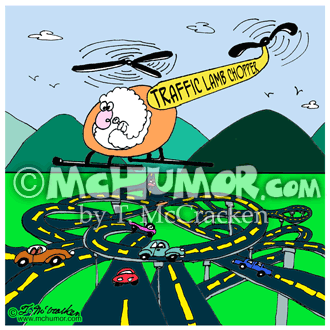 Helicopter Cartoon 7131: "Traffic Lamb-Chopper." A traffic helicopter flown by a sheep. 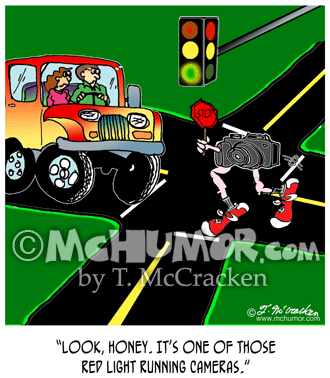 Traffic Cartoon 8531: A camera holding a stop sign runs across a road at a stop light. "Look, honey. It's one of those red light running cameras." 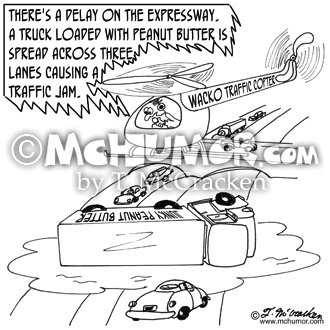 Traffic Cartoon 4887: A report from a helicopter, "There's a delay on the expressway: A truck loaded with peanut butter is spread across three lanes causing a traffic jam." 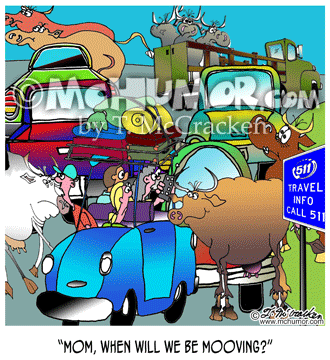 Cow Cartoon 8535: Traffic is backed up with a cattle truck at the front and cows escaping and blocking traffic. 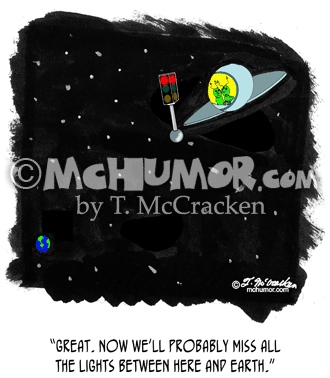 A kid in a car asks, “Mom, when will we be mooving?" 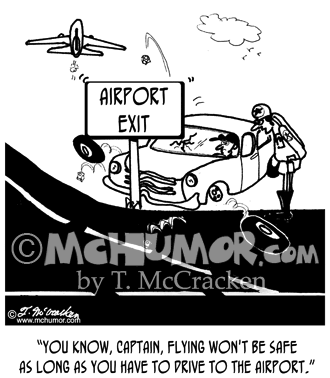 Pilot Cartoon 3681: A highway patrolman saying to a pilot who's driven his car into an Airport Exit sign, "You know, Captain, flying won't be safe as long as you have to drive to the airport."